An all time favorite, the Ohio Star block is featured in both the Country Flag Wallhanging and the six Mini Flag Placemats. These flags are a breeze with strip piecing and assembly-line sewing techniques. Finish the 33"x 43" wallhanging with machine quilting and a binding. Quick turn the six placemats for a fast project. 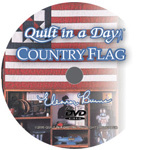 Instructions include napkin rings, patriotic party favors and making one mini flag.